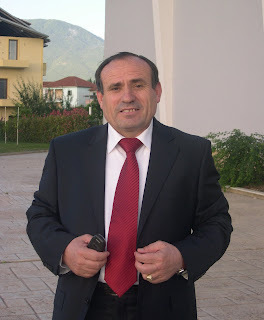 The well-known intellectual and writer Shefki Hysa, with his initiative, since the origins of democracy, founded the publishing house with the name of the international and Cham literature symbol, Bilal Xhaferri, to heighten the cultural values of an omitted region as it is Chameria. This publishing house, besides the promotion of Chameria cultural and artistic values, helped and published all the creations of the dissident writers, detested by the communist dictatorship, like the works of the Albanian Mandela, Pjetër Arbnori and the manuscripts of Bilal Xhaferri, Namik Mane and of many other persecuted writers. Besides, a lot of world literature works that were prohibited in the dictatorship period were published in the Publishing House “Bilal Xhaferri”. This publishing house expanded and became known even in Kosovo, Macedonia, Montenegro and in all the Albanian lands of Diaspora, up to America. That’s why the creators and the artists are grateful to the indefatigable writer and intellectual Shefki Hysa. Besides, Shefki Hysa created even the Cultural Association “Bilal Xhaferri” with a group of Cham writers, artists and journalists, as well as many friends of the writer Bilal Xhaferri. Shefki Hysa has a special merit for the exaltation of Bilal Xhaferri’s figure. And we, the friends of Bilal, should know at first this merit, we should be grateful to him for life, not only for his indefatigable work in the issue of the Cham culture promotion, but because he did what we didn’t do. He did the impossible, going in the highest instances of the Albanian state, and brought the bones of our big writer Bilal Xhaferri, which repose now in the Jonian sea-line, in the lands of the martyr Chameria that Bilal loved so much. Shefki Hysa’s work doesn’t finish here. He took “Eagle’s wing” magazine that Bilal founded and set up in Chicago, America, where he published 39 numbers and made it flew like an eagle in Tirana. And now “Eagle’s wing” has reached over 80 numbers. 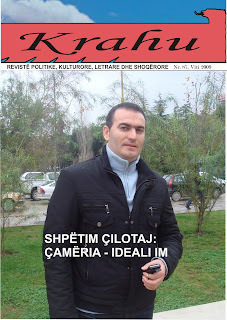 This magazine will live as our Albanian mountains will live.